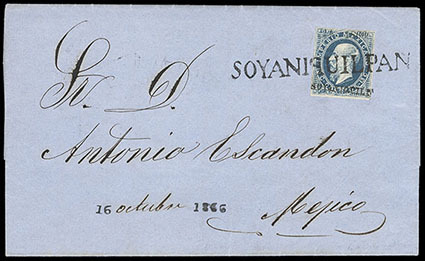 Mexico, 1866-67 Maximilian essay, Ingram type 14, the finished design but without the indicias, full margins, thin and sealed tear at top, Very Fine appearance, very rare with less than five known. Mexico, 1866-67, 10c-40c Emperor Maximilian essay, Italian essay in greenish blue, composite strip of 3 of 10c, 25c and 40c values, couple small thins at left, otherwise Very Fine. 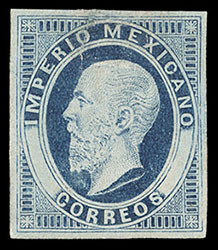 Mexico, 1866-67 Emperor Maximilian essay, private die essay in blue on wove, "IMPERIO MEX, POSTAS" with semi profile portrait, Very Fine, very scarce. 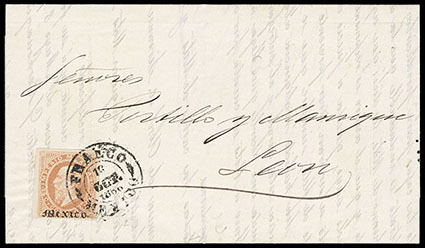 Mexico, 1866-67 Emperor Maximilian essay, private die essay in brown, "POSTES" with blank denomination, horizontal crease, Very Fine appearance, probably of Belgian origin, with less than 5 known. 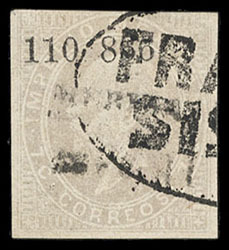 Mexico, 1866, Emperor Maximilian (litho), 7c lilac gray, Merida, cons 110-866 (certificate says probable illegible 1866-41 sub-consignment), oval Sisal cancel (Schatzkes 805 - 10 points), Very Fine (NF $200), 41 is among the numbers skipped over in the Chapman list. 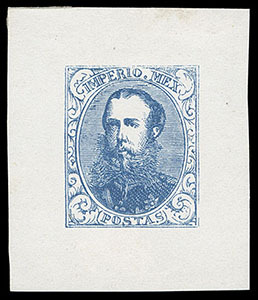 Mexico, 1866, Emperor Maximilian (litho), 13c blue, Soyaniquilpan, district overprint applied after stamp placed on cover (tying stamp), cons 14-1866, additionally tied by straight line Soyaniquilpan handstamp with date stamp at lower left (Schatzkes 1546), on 1866 folded letter to Mexico, Very Fine and choice. 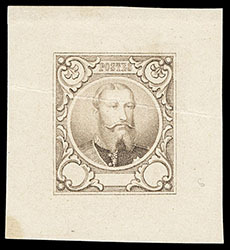 Mexico, 1866, Emperor Maximilian (litho), 25c orange, Mexico, district name only, full margins, tied by "Mexico, 16 Oct, 1866" cds on fresh folded letter to Leon; vertical file fold affecting stamp, otherwise Very Fine and attractive, name only stamps were issued in very small quantities at the beginning of the issue to be exchanged for demonetized Eagles, probably only 3-4 covers exist of this denomination. Scott No. 29 Estimate $2,500 - 3,500. 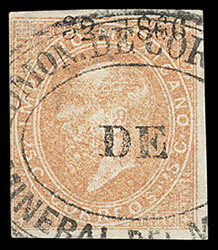 Mexico, 1866, Emperor Maximilian (litho), 25c orange, Pachuca, cons 32-66, oval Mineral del Monte cancel (Schatzkes 1133), Very Fine. Scott No. 29 Estimate $150 - 200. 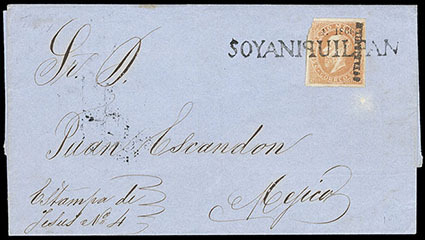 Mexico, 1866, Emperor Maximilian (litho), 25c orange, Soyaniquilpan, cons 14-1866, margins large to in at upper left, tied by straight line Soyaniquilpam on 1867 folded letter sheet to Mexico, receiving backstamp, Very Fine, rare with only three covers recorded in the census. Scott No. 29 Estimate $1,500 - 2,000. 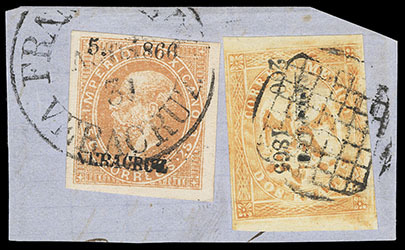 Mexico, 1866, Emperor Maximilian (litho), 25c orange, Veracruz, cons 5-1866 on a piece in combination with 1865, Eagle (4th Period), 2r orange, Tampico, cons 200-1865, Maximilian stamp tied by Veracruz town cancel (Schatzkes 1757A) and Eagle issue tied by Tampico grid handstamp (Schatzkes 1578), with town cancel dated Aug 31, the Eagle stamp was affixed first in Tampico once the issue was demonetized and received in Veracruz were the Maximilian stamp was added to correct for the error, Very Fine, one of the key rarities of both issues, there are only two recorded cases of combination of these 2 issues, the other is a cover which sold years ago in private treaty in $30,000; with 1998 M.E.P.S.I. certificate. Scott No. 29+23 Estimate $1,500 - 2,000.